Glenn Hoddle (born 27 October 1957) is an English former footballer and manager who played as a midfielder for Tottenham Hotspur, AS Monaco, Chelsea and Swindon Town and at international level for England. He was most recently first team coach at Queens Park Rangers having been appointed, on a part-time basis, to assist Harry Redknapp in the summer of 2014. However, following Redknapp's resignation in February 2015, Hoddle also left the club. In 2007 he was inducted into the National Football Museum Hall of Fame, which cited him as one of the most gifted English footballers of his generation, exhibiting "sublime balance and close control, unrivalled passing and vision and extraordinary shooting ability, both from open play and set pieces". He has been manager of Swindon Town (earning promotion to the Premier League), Chelsea (taking them to the FA Cup final), Southampton, Tottenham Hotspur (reaching a League Cup final) and most recently Wolverhampton Wanderers. As manager, he took England to the World Cup second round in 1998, where they lost to Argentina on penalties. He is currently running the Glenn Hoddle Academy in Spain, set up to help young British players return to professional football after being released by their clubs. Hoddle's younger brother Carl was also a footballer and died from a brain aneurysm on 2 March 2008 at the age of 40. Hoddle was born in Hayes, Middlesex. He started his career at Watford, having been a product of their youth academy. Hoddle also played over 45 matches for his secondary school before being spotted at a school football game by a passing scout who was apparently walking his dog at the time. Hoddle joined the club as a schoolboy apprentice in April 1974 following the recommendation of another Tottenham legend, Martin Chivers. He successfully overcame knee problems in his early teens and collected England Youth caps prior to making his first-team debut as a 17-year-old substitute against Norwich City in August 1975. Spurs drew 2–2. Hoddle was forced to wait until February 1976 to start a First Division match and immediately announced his arrival with a spectacular strike past Stoke City and England goalkeeper Peter Shilton. He flourished under the management of Keith Burkinshaw and despite the club's relegation to the Second Division in 1976–77 after 27 seasons of First Division football, a Hoddle-inspired Spurs side won promotion to the top flight at the first attempt. As Tottenham's transitional phase continued, Hoddle's enigmatic and often controversial international career began in December 1976 against Wales in an Under-21 fixture. He would collect another seven caps at that level and play twice for the England 'B' team prior to scoring on his full international debut against Bulgaria in November 1979. The 1979–80 campaign heralded the emergence of Hoddle as a top-class player; the 22-year-old midfielder scored 19 goals in 41 league appearances and was awarded the PFA Young Player of the Year award at the end of the season. In 1981, he starred as Spurs won the FA Cup for the sixth time, defeating Manchester City in a replay and the following season Tottenham retained the FA Cup (Hoddle scored in both the Final and Final replay) and finished the League campaign in fourth place, the club's best league position since 1971. Hoddle performed as the midfield fulcrum in many of these successes and also contributed magnificently as the team reached the final of the League Cup, losing 3–1 to Liverpool, and the semi-final stage of the European Cup Winners Cup. During the summer of 1982, Hoddle played in two of England's matches in the opening group phase of the FIFA World Cup, starting against Kuwait after a substitute appearance in a 2–0 victory over Czechoslovakia. Hoddle's involvement in the following three seasons was limited by a number of niggling injury problems (he started only 76 of a possible 126 league matches) but nevertheless, Hoddle proved to be the architect behind the team's 1984 UEFA Cup triumph despite missing the Final due to fitness concerns. In October 1983, he helped Spurs win 6–2 on aggregate against a Feyenoord Rotterdam side containing Johan Cruyff. Such was the quality of his performance in both matches, the Dutch legend entered the Tottenham dressing room and offered Hoddle his shirt as a sign of respect. Spurs came close to further honours in the next three seasons, reaching third place in the First Division and the quarter-finals of the UEFA Cup in 1984–85 and another FA Cup Final in 1987, losing 3–2 to Coventry City, the only time the North London club has experienced defeat in the final of the famous knock-out competition. The unexpected loss to the Midlands side was Hoddle's last match for Spurs as newly appointed AS Monaco manager Arsène Wenger brought him to the principality for a fee of £750,000. Between 1975 and 1987, the gifted playmaker scored 110 goals in 490 first-team matches in all competitions, only four players (Steve Perryman, Pat Jennings, Gary Mabbutt and Cyril Knowles) have made more appearances in a Spurs shirt. At international level, Hoddle won 44 caps for England during his Tottenham career. In 1987, Hoddle also found himself in the pop charts, with the single "Diamond Lights'" making the UK Top 20 in a duet with Spurs and England team-mate Chris Waddle. 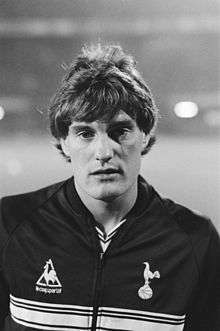 Hoddle announced in 1987 that he would be leaving Tottenham Hotspur at the end of the season to pursue a career overseas where his style of play would be appreciated by continental managers and supporters, and to play European level football with English clubs banned after Heysel. He joined AS Monaco alongside George Weah and fellow Englishman Mark Hateley and immediately inspired the club to the 1988 Ligue 1 championship, its first league title in six seasons. Hoddle was voted the Best Foreign Player in French football and helped to guide the team to the quarter-finals of the European Cup in the 1988–89 campaign. Arsène Wenger was the coach who brought him to Monaco and ironically Hoddle would go on to face his former manager in the heated North London Derby as manager of Tottenham Hotspur. However, a severe knee injury curtailed his career at the highest level and in November 1990, the 33-year-old left the club by mutual consent having helped to improve the standing of English footballers in foreign countries. During his three and a half-year spell in France, Hoddle represented England nine times, making his international farewell against the Soviet Union in June 1988. He returned to England and signed for Chelsea on a non-contract basis, leaving Stamford Bridge in March 1991 without playing a senior match to assume his first managerial post as player-manager of Swindon Town. Hoddle made his debut in England's Euro 80 qualifying tie against Bulgaria on 22 November 1979, scoring in a 2–0 win at Wembley. He scored in his third appearance against Australia on 31 May 1980 in a friendly in Sydney. His third goal came in his fifth appearance on 25 March 1981 in a game against Spain at Wembley, which England lost 2–1. He reached the 10-cap point of his career on 27 April 1982 in the British Home Championship clash with Wales in Cardiff, which England won 1–0. By this stage of his international career he had scored four goals. He was included in the 1982 and 1986 FIFA World Cup squads, playing an important role in the latter campaign when England reached the quarter-finals against Argentina. Hoddle also featured prominently in the European Championship squads of 1980 and 1988, making his 53rd and final international appearance in the final group game of Euro 88, in a 3–1 defeat to the Soviet Union in West Germany. He had scored eight goals for the England senior side in a career stretching nine years, the last of his international goals coming on 23 April 1986 in a 2–1 friendly win over Scotland at Wembley. Hoddle arrived at a troubled club with The Robins badly affected by a financial scandal which had seen them stripped of promotion to the First Division at the end of the 1989–90 season, a controversy which had negatively impacted the team's league form as they had been forced to sell several key players including midfielder Alan McLoughlin. Hoddle prevented Swindon from slipping into the Third Division and further improvement throughout the 1991–92 season saw the Wiltshire club finish ninth, just missing out on a play-off place. They had briefly led the table in October. Swindon reached the new Division One play-offs in 1993 and beat Leicester City 4–3 at Wembley, and were then promoted to the Premier League. Hoddle scored Swindon's first goal of the final. The 36-year-old Hoddle was one of the most highly rated young managers in England and many bigger clubs were demanding his services. Just days after guiding Swindon to promotion, he accepted the offer to manage Chelsea and was succeeded at Swindon by his assistant and former Spurs team-mate John Gorman. In June 1993, Hoddle became player-manager of Chelsea (he retired from the playing side in 1995). His assistant at Chelsea was the former Tottenham manager Peter Shreeves, and they reached the FA Cup final in Hoddle's first season, where they lost 4–0 to Manchester United. But United had done the double, and consolation for their failure to win the trophy came in the form of a Cup Winners' Cup place. Chelsea reached the semi finals of that competition in 1994–95 and lost by a single goal to Real Zaragoza, who went on to beat Arsenal in the final. Hoddle guided Chelsea to the FA Cup Semi-finals in 1995–96, but was unable to take them beyond 11th place in the Premiership – they had occupied this final position three times in four years. He did establish them as a force in cup competitions and made them capable of attracting top-class players – such as Ruud Gullit – to the club. “ "My beliefs have evolved in the last eight or nine years, that the spirit has to come back again, that is nothing new, that has been around for thousands of years. You have to come back to learn and face some of the things you have done, good and bad. There are too many injustices around." "You and I have been physically given two hands and two legs and half-decent brains. Some people have not been born like that for a reason. The karma is working from another lifetime. I have nothing to hide about that. It is not only people with disabilities. What you sow, you have to reap." "You have to look at things that happened in your life and ask why. It comes around." On 30 January 1999, with the England team preparing for Euro 2000, and amidst the fall-out from the previous season's World Cup, Hoddle gave an interview to Matt Dickinson of The Times newspaper in an attempt to defend himself against his critics (over issues such as Eileen Drewery and his faith) and show a strong front for the remainder of the qualifiers. Dickinson's interview revealed that Hoddle had a "controversial belief that the disabled, and others, are being punished for sins in a former life." Hoddle's comments were criticised by several politicians including Sports Minister Tony Banks and Prime Minister Tony Blair. Public opinion, based upon the immediate media furore resulted in (according to one BBC poll) 90% of respondents believing Hoddle should not continue as English manager. However, the BBC survey showed that while many considered his comments insensitive to disabled people, others defended his right to express his religious beliefs by claiming that to sack him would constitute religious discrimination. Hoddle stated that he was not prepared to resign and claimed his words were misinterpreted and pointed out his contributions and commitment to organisations helping disabled people. The Football Association terminated Hoddle's contract on 2 February 1999, which was welcomed by representatives of disabled groups. The disabled rights campaigner Lord Ashley however, while criticising Hoddle's views, defended his right to express them, likening the campaign against Hoddle to a "witchhunt" and considered Hoddle's dismissal "a sad day for British tolerance and freedom of speech" a view which was shared by the Daily Mirror and Daily Mail and in several foreign newspapers. Some writers considered the remarks were used as a pretext to get rid of him. Hoddle apologised for the offence that had been caused, stating it had never been his intention and continued to fundraise for disabled groups after being dismissed. Much later criticism was made of Hoddle's dismissal on the grounds that he had been forced out for non-footballing reasons. Hoddle was back in football within a year as Southampton manager, succeeding Dave Jones, who had been suspended to concentrate on clearing his name in connection with child abuse charges. Although these charges were later found to be false, Jones was not re-instated and Hoddle continued to be manager. Hoddle kept the Saints in the Premier League against all odds but left acrimoniously in March 2001 to return to Tottenham as manager. Southampton were on course for a 10th-place finish – their highest since 1995 – when Hoddle left. Tottenham's league record in the decade leading up to Hoddle's appointment was disappointing; they had not finished in the top five since 1990 and their only major trophies in that time had been the FA Cup in 1991 and Football League Cup in 1999. Hoddle was determined to establish them as a top playing side, and during his first season he had some wonderful opportunities to succeed. Just days after his appointment in April 2001, his first match in charge was an F.A Cup semi-final against great rivals Arsenal which Spurs lost 2–1. The following year, Tottenham reached the League Cup final in February 2002; after winning 5–1 against Hoddle's former club Chelsea in the semi-final second leg, Spurs were the favourites but they lost 2–1 to Blackburn Rovers. The club's promising early season form (which saw Hoddle voted Premier League Manager of the Month for October 2001) dwindled away into mediocrity and they finished ninth in the Premiership, an improvement on the previous season's 11th place but considerably less than what most people had been expecting. Spurs began the 2002–03 season in fine form and Hoddle was named Premiership Manager of the Month for August 2002 after they ended the month top of the league. Although few people expected them to stay there, 10th place in the final table was still disappointing. The pressure began to build up on Hoddle and he was sacked in September 2003 after a poor start to the season, in which the team picked up just four points from their opening six league games and lay in the Premiership relegation zone. Coincidentally, his final game in charge was a 3–1 loss to old side Southampton. Hoddle was linked with a return to Southampton in early 2004, but opposition from supporters meant chairman Rupert Lowe pursued alternative targets and ultimately selected Paul Sturrock instead. Instead he returned to management on 7 December 2004 with Wolverhampton Wanderers, again succeeding Dave Jones. Wolves lost only one of remaining 25 games but failed to reach the play-offs because 15 of those games had been draws. Wolves were expected to finish in the top 6 under Hoddle in the 2005–06 season but again draws cost them with Wolves drawing 19 of their 46 league games. They were also one of the lowest goalscoring teams in the division scoring just 50 goals in the league all season. Wolves finished 7th, 8 points off the playoffs. Wolves fans turned against Hoddle and there were chants against him during the last home game of the season against Watford. The board kept faith with Hoddle, but he stepped down on 1 July 2006, stating differing expectations between himself and the club as the reason for his departure. In his time with Wolverhampton Wanderers, the club drew 34 league games in his 76 games in charge, spanning over two seasons. His name was linked with the manager's job at Leeds United (owned by former Chelsea chairman Ken Bates) when Kevin Blackwell was sacked in September 2006, but the job went to Dennis Wise (who had played for Chelsea when Hoddle was the manager) instead. By January 2008, Hoddle was attempting to raise the capital to form the Glenn Hoddle Academy based in Spain. The aim of the academy is to give another chance to young players released by football clubs in England to become professional players. Ikechi Anya was his first player at the academy to get a professional contract at a club, with Sevilla Atlético in Spain. In June 2011, it was announced that The Glenn Hoddle Academy had linked up with English Conference North side Hyde. The Academy had previously enjoyed a link with the Spanish fourth-tier side Jerez Industrial, providing their entire squad and coaches, but fell out in a dispute over cash. Hoddle says he has had 26 serious management offers but insists he will not return to management until the academy is able to run itself. In April 2014 he revealed he had come close to taking over from Andre Villas Boas at Tottenham, before the job was given to Tim Sherwood. "I did have talks with Daniel Levy and the club," Hoddle said. "He wanted a little bit of advice and a bit of a sounding board for himself. "[I said) 'I am there for you if you want me to take it to the end of the season and then we will have a little look at it then, I would be prepared to do that'. "I wouldn't do it for any other club for that short period of time. It was just that it is in my DNA. I have loved my time at other clubs, I really have, but being a Spurs supporter since I was eight, going there very young, it is in my blood." In August 2014, Hoddle was appointed first team coach at Queens Park Rangers under Harry Redknapp. However, on 3 February 2015, Redknapp resigned, following which Hoddle also left the club. In June 2016, after England's 2-1 loss to Iceland at Euro 2016 and manager Roy Hodgson's subsequent resignation, Harry Redknapp and Alan Shearer both put forward Hoddle as a candidate for the job before Sam Allardyce was appointed. Hoddle also works as a football pundit, where he worked mainly with Sky Sports but also worked for ITV during their coverage of the 2014 FIFA World Cup. In 2015, Hoddle became a pundit for BT Sport. ↑ Hugman, Barry J., ed. (2005). The PFA Premier & Football League Players' Records 1946–2005. Queen Anne Press. p. 291. ISBN 9781852916657. ↑ "Glenn Hoddle - International Appearances". The Rec.Sport.Soccer Statistics Foundation. ↑ "Glenn Hoddle: QPR appoint former England boss as first-team coach". BBC Sport. 12 August 2014. Retrieved 12 December 2014. ↑ "England Managers - Glenn Hoddle". ↑ Administrator. "Australia Vs England 1980". ↑ "Football photographic encyclopedia, footballer, world cup, champions league, football championship, olympic games & hero images by sporting-heroes.net". ↑ "Swindon promotion heroes turn back the clock". BBC News. BBC. 27 May 2010. Archived from the original on 31 May 2010. ↑ "Family tree of champions Chelsea". BBC Sport. BBC. 30 April 2005. Archived from the original on 29 October 2013. Retrieved 16 December 2007. ↑ Dickinson, M (22 November 2007). "Pompey boss Redknapp: I'd love England job but I can't see it coming my way". Mail Online. Daily Mail. Archived from the original on 25 May 2011. Retrieved 16 December 2007. ↑ Archived 1 June 2010 at the Wayback Machine. 1 2 Dickinson, M (30 January 1999). "Hoddle puts his faith in God and England". The Times. Retrieved 16 December 2007. ↑ "Eileen Drewery: Hod, God and the Squad". BBC News. BBC. 1 February 1999. Archived from the original on 29 September 2013. ↑ "Blair adds voice to wave of criticism engulfing Hoddle". CNN. 1 February 1999. Archived from the original on 6 January 2014. Retrieved 16 December 2007. ↑ "You said Hoddle should go". BBC News. 1 February 1999. Archived from the original on 17 December 2013. Retrieved 3 May 2010. 1 2 "World press dumbfounded". BBC News. 3 February 1999. Archived from the original on 6 January 2014. Retrieved 3 May 2010. ↑ "More bad karma for Hoddle". BBC Sport. 30 January 1999. Archived from the original on 12 May 2010. Retrieved 16 December 2007. ↑ "Hoddle awaits fate". BBC News. BBC. 1 February 1999. Archived from the original on 13 November 2012. Retrieved 3 May 2010. 1 2 "Hoddle sacked". BBC Sport. 3 February 1999. Archived from the original on 13 November 2012. Retrieved 16 December 2007. 1 2 "A victory for football". BBC Sport. 2 February 1999. Archived from the original on 13 November 2012. Retrieved 3 May 2010. ↑ "Hoddle's position 'untenable'". BBC News. 2 February 1999. Archived from the original on 13 November 2012. Retrieved 3 May 2010. ↑ "Zara's support brings Hoddle to tears". BBC News. 3 February 1999. Archived from the original on 13 November 2012. Retrieved 3 May 2010. ↑ "A reader asks the WSWS to comment on the sacking of England football coach Glen Hoddle - World Socialist Web Site". 19 February 1999. ↑ "Hoddle poses with disabled group". BBC News. 10 May 1999. Archived from the original on 13 November 2012. Retrieved 16 December 2007. ↑ Harris, Harry (8 December 2007). "Hoddle just the Job". Daily Express. London. ↑ "Hoddle out of Saints race". BBC Sport. 3 March 2004. Archived from the original on 22 July 2014. Retrieved 16 December 2007. ↑ "Wolves appoint Hoddle as manager". BBC Sport. 7 December 2004. Archived from the original on 19 December 2013. ↑ Instone, David (15 April 2006). "Hoddle threatened by Moxey's fury". The Independent. London. Retrieved 8 July 2007. ↑ "Hoddle resigns as boss of Wolves". BBC Sport. 1 July 2006. Archived from the original on 19 December 2013. Retrieved 8 July 2007. ↑ "Manager resigns". Wolverhampton Wanderers F.C. 1 July 2006. Archived from the original on 16 February 2012. Retrieved 8 July 2007. ↑ Syed, Matthew (18 January 2009). "Game remains a labour of love for English football's greatest enigma, Glenn Hoddle". The Times. London. Retrieved 19 January 2008. ↑ Worden, Tom (13 September 2010). "The Spanish team thats full of Englishmen". The Sun. London. Retrieved 15 September 2010. ↑ "Glenn Hoddle Academy link up with Hyde". BBC Sport. BBC. 28 June 2011. Archived from the original on 6 January 2014. Retrieved 28 June 2011. ↑ "Glenn Hoddle reveals how close he became to returning to Tottenham as manager". Sky Sports. 19 April 2014. Archived from the original on 22 July 2014. Retrieved 24 June 2014. ↑ "Tim Sherwood favourite to succeed Harry Redknapp at Queens Park Rangers". telegraph.co.uk. The Telegraph. 3 February 2015. Retrieved 3 February 2015. ↑ "Euro 2016: Gareth Southgate should not be next England boss - Harry Redknapp". BBC Sport. Retrieved 2016-06-28. ↑ "Sam Allardyce named England manager by the Football Association". BBC Sport. Retrieved 2016-09-01. ↑ "Glenn HODDLE(グレン・ホドル) @ LEVEL-K". ↑ "Glenn Hoddle". Football Database.eu. Retrieved 2 October 2012. ↑ "England Hall of Fame". FA.com. Retrieved 17 May 2007. ↑ "Spurs sack Hoddle". BBC News. 21 September 2003. ↑ "Team of the Century: 1977-1996 - Souness, Robson & Hoddle...not a bad midfield trio!". GiveMeFootball.com. Give Me Football. 30 August 2007. Archived from the original on 22 October 2008. Retrieved 22 September 2016. ↑ France - Footballer of the Year Archived 5 September 2015 at the Wayback Machine. Wikimedia Commons has media related to Glenn Hoddle.